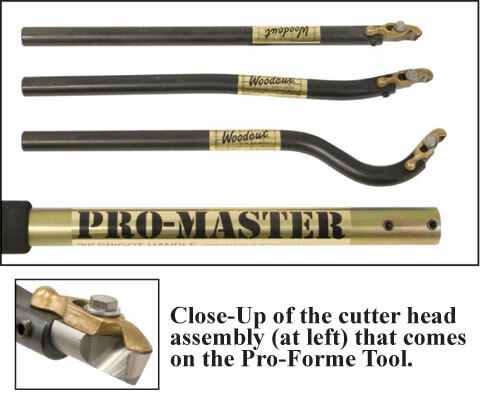 The Pro-Forme Hollowing Tools (pictured above) are known for fast wood removal while leaving a smooth finish. They feature a Patented M2 high speed steel hook cutter designed to prevent catches. The design also keeps the cutter from clogging with shavings. The cutter assembly features an adjustable Safety Cutting Gauge on the top that is used to set the depth of cut. It also acts as a bevel to help control the cutting action. The Pro-Forme Tools are available with three shank styles: A. Straight, B. Slight Bend and C. Bent. Each shaft measures 5/8 diameter by 12-1/2 long and includes a cutter with the Safety Gauge. Each shaft is held in the Pro-Master Handle or in other handle systems. The Pro-Master Handle measures 1-1/16 diameter by 20 with a foam rubber grip that is 1-1/2 diameter to limit fatigue during use. The design allows for a second Pro-Master handle to be attached to allow for deeper vessels to be turned. We also offer the Pro-Forme in a smaller size called the Flexi Hollower. It features a smaller hook cutter with Depth Gauge like the similar to the larger tool. The Flexi has two adjustable links that allow the cutter head to be straight or angled. This allows access to difficult to reach areas. It has 1/2" shaft with an overall length of 10".